Founded in 1999, EPCOS is a part of TDK Group Company with its headqurters in Munich, Germany. 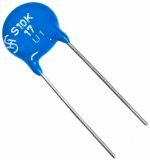 The company specializes in manufacturing of high power capacitors, ceramic components, EMC filters, varistors, thermistors, fuses, surge protection, inductances (anti-interference chokes), sensors, SAW components and ferrites. EPCOS products are manufactured with the most advanced technology and could be distinguished by their high quality and German precision. The company relies on high technology, quality materials and extreme precision in the production process. EPCOS is an international corporation, which employs approximately 24,000 employees worldwide in more than 20 design and production sites, and develops, manufactures and markets electronic components, modules and systems. VIKIWAT Ltd. is a wholesaler and offers to its customers a variety of EPCOS AG product line. 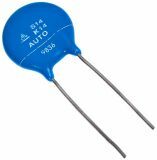 In our offline and online stores, you can easily buy large quantities of metal oxide varistors, thermistors with resistance and many other products at affordable prices with quick delivery. 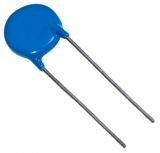 Thermistor, NTC, 22 kOhm, Ф5x5 mm Thermistor NTC,with resistance 22 kOhm. List Price 0.85лв. VAT Incl. 0.81лв. VAT Incl. 0.77лв. VAT Incl. 0.72лв. VAT Incl. 0.68лв. VAT Incl. 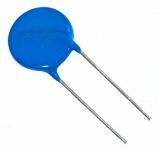 Thermistor, NTC, 47 kOhm, Ф5x5 mm Thermistor NTC,with resistance 47 kOhm. 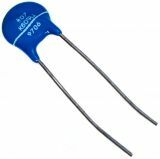 Thermistor, NTC, 100 kOhm, Ф5x5 mm Thermistor NTC, with resistance 100 kOhm. 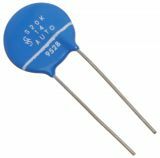 Varistor 95VAC, 125VDC, 150V, 1200A, THT, S07K95 Varistor S07K95 with maximum voltage AC 95 V, maximum voltage DC 125 V and peak surge current 1200 A.
Varistor 140VAC, 180VDC, 220V, 8000A, THT, S20K140 Metal-oxide varistor S20K140 with maximum voltage AC 140 V, maximum voltage DC 180 V and peak surge current 8000 A.
Varistor 150VAC, 200VDC, 240V, 2500A, THT, S10K150 Varistor S10K150 with maximum voltage AC 150 V, maximum voltage DC 200 V and peak surge current 2500 A.
Varistor 150VAC, 200VDC, 240V, 8000A, THT, S20K150 Metal-oxide varistor S20K150 with maximum voltage AC 150 V, maximum voltage DC 200 V and peak surge current 8000 A.
Varistor 230VAC, 300VDC, 360V, 2500A, THT, S10K230 Varistor S10K230 with maximum voltage AC 230 V, maximum voltage DC 300 V and peak surge current 2500 A.
Thermistor, NTC, 10 kOhm, Ф6x26 mm, with cable Thermistor, NTC,with resistance 10 kOhm(25°C). 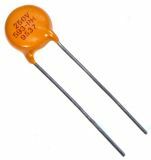 Varistor 250VAC, 320VDC, 390V, 1200A, THT, S07K250 Varistor S07K250 with maximum voltage AC 250 V, maximum voltage DC 320 V and peak surge current 1200 A. List Price 0.35лв. VAT Incl. 0.33лв. VAT Incl. 0.32лв. VAT Incl. 0.30лв. VAT Incl. 0.28лв. VAT Incl. 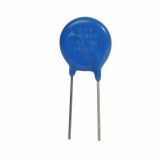 Polyester Capacitor 10nF, 400V, +/-5% Capacitor, polyester, with operating voltage 400 V, capacitance 10 nF and case dimensions 7 x 3 x 6 mm. Varistor 275VAC, 350VDC, 430V, 4500A, THT, SIOV-S14/K275 Varistor SIOV-S14/K275 with maximum AC voltage 275 V, maximum DC voltage 350 V and peak surge current 4500 A.
Varistor 300VAC, 385VDC, 470V, 4500A, THT, S14K300 Metal oxide varistor S14K300 with maximum voltage AC 300 V, maximum voltage DC 385 V and peak surge current 4500 A. List Price 0.50лв. VAT Incl. 0.48лв. VAT Incl. 0.45лв. VAT Incl. 0.43лв. VAT Incl. 0.40лв. VAT Incl.